Lake Kah Tan Da Estates is a gated recreational/residential development in southeast Missouri, located approximately ninety miles south of St. Louis off Rte 55 (exit 129). We have approximately nine hundred acres of property, three, forty acre lakes and miles of roads and trails. Lot owners can use their registered, insured watercraft on our lakes and ride their registered, insured atvs and utvs and can enjoy fishing, swimming, hiking, camping, boating, and many other fun activities on our property in a quiet, secluded, private and secure atmosphere. Each of our lakes has a sandy beach and restroom facilities. 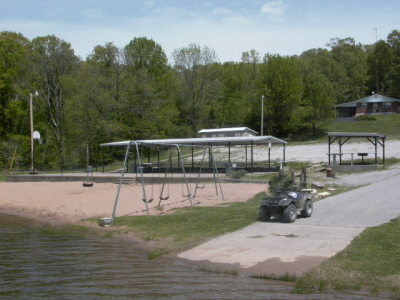 Lake #1 has a pavillion where lot owners and guests can gather and shower rooms, electric, running water and grills. The pavilion can be reserved for lot owners' private gatherings. We currently have twenty-six lots available, from .7 to 1.5 acres in size. Please contact us for details and to schedule tour, we think you'll love it.